Bananas are fruit that grow in a big bunch (as many as 150 bananas) on a banana plant. The fruit hangs downward from the plant. Only one bunch at a time is produced from each plant. Bananas grow in humid, tropical climates. Bananas grow on stalks or "false trunks." 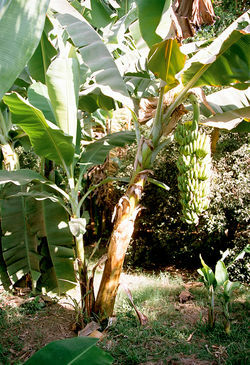 While the banana plant looks like a tree, it is really a very large herb. An herb is a plant does not produce any woody parts above ground. The chief producers of bananas in Middle America and the West Indies are Costa Rica, Honduras, Guatemala, Mexico, Panama, the Dominican Republic, Guadeloupe, Jamaica, and Martinique; in South America, Brazil, Colombia, and Ecuador; in Africa, Spain's Canary Islands, Ethiopia, Cameroon, Guinea, and Nigeria; and in Asia, Taiwan.